I also loved their name! thanks for this tutorial. Can I use the same tips for Cami? Hi Silvia! The Camí dress has a high waistline so I don't think you need to do that. You should make a toile of the bodice and at least one sleeve to check the fit but I think the regular sizes will fit you correctly with the darts shaping and the high waist. Let me know how it goes. Great tutorial, Betsy! 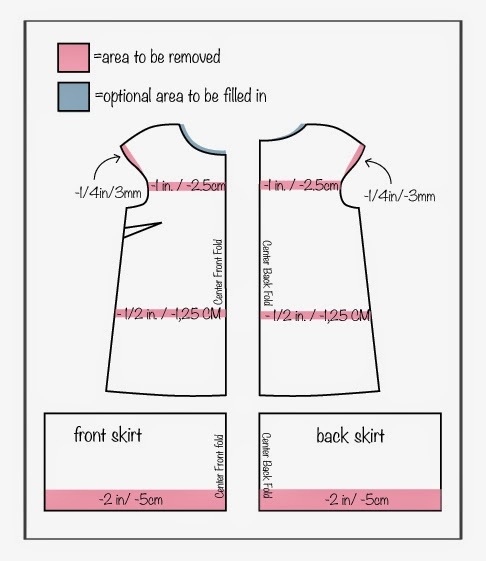 I hope to make a Malvarosa dress this year and will be referring to your how-to when the time comes. Hope all is well! Pauline me parece genial este gran tutorial para las petits!!. Genial explicado y muy necesario..creo!!. El tuyo te quedaba perfecto Sonia! Es que eres alta (pues si, 1,65 es alto para mi, jeje). Thanks for letting me make your dress petite Pauline! I love it and will definitely be wearing it this summer…a lot! Thanks to you for this great tutorial Betsy! It's absolutely perfect and your dress is so pretty! These changes are so simple and they work so well. Thanks for the tutorial! I make similar alterations to the patterns I use, but I wouldn't have thought of shortening a cap sleeve. I can see the difference in Betsy's dresses, 3mm really matter! ? I made the petite adjustments as recommended but I also found the darts needed to be lowered as well.